Major highway works to improve traffic flow at Junction 17 of the M5 are currently being carried out. Next month this will involve a number of temporary lane closures through the junction with signed diversions in place. Following a successful bid for £1.14 million pinch point funding last year, this scheme is aimed at tackling capacity issues on the local road network at Junction 17 of the M5. Lane closures will start on Saturday 9 May and will last for approximately two weeks before the road network will be fully operational by the Bank Holiday Monday on May 25. Road users are being encouraged to plan their journeys in advance to avoid any unnecessary delays during the planned roadworks which will see a number of lane closures in place on the roundabout and on some of the approach roads. 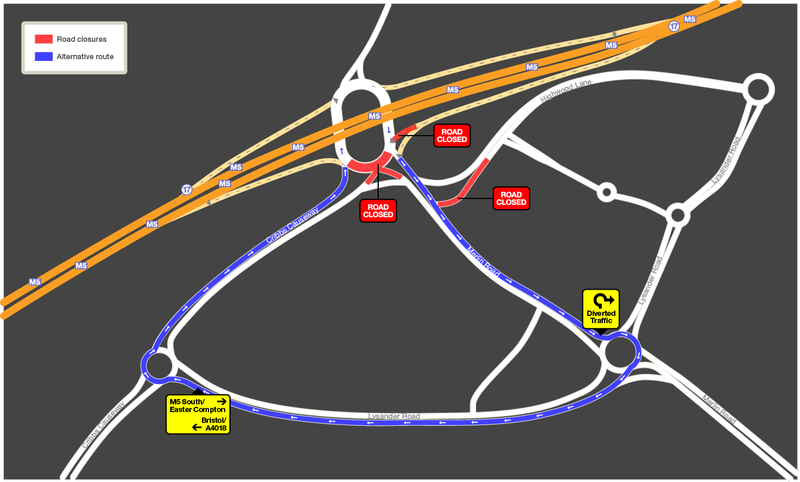 Motorists who regularly use the roundabout at Junction 17 of the M5 will be aware of road widening works which have been taking place to provide additional traffic lanes. These works are nearing completion with one major operation left to complement these improvements which includes replacing all of the traffic light signal control equipment which monitors traffic flow which has come to the end of its working life.